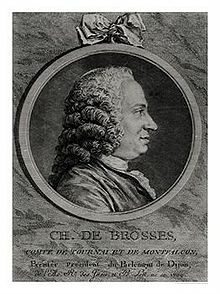 Charles de Brosses (1709-1777) was a celebrated French politician and writer. He was president of the regional parliament of Burgundy in Dijon. He had an interest in geology, history and philology and is credited with coining the geographical term ‘Australasia’. He also believed that Atlantis was located in the Atlantic in keeping with the prevailing fashion of the period.